There’s an infamous skit in 2004’s Chappelle Show in which Charlie Murphy describes playing a game of basketball against music legend Prince. I remember thinking that it could never be true — Prince, the flamboyantly dressed musician, couldn’t possibly also be a trash-talking basketball maestro as well. But I was wrong, and Prince actually was a fantastic baller, having been a Minnesota high school basketball star whose competitiveness was a part of everything he did. Murphy isn’t prepared, going into the game as if it was going to be a cakewalk, as if he could just walk the ball to the hoop and casually drop it in. Prince proceeds to demolish Murphy, using blocks and rebounds, hitting incredible shots and initiating school yard bullying with the ball and his choice of words. I remember the closing lines of that skit, in which the Purple One yells “Game, blouses” to his opponents as his frilled suit wearing team completes the obliteration. I was on the receiving end of these types of matches in NBA Playgrounds many times. I was schooled. I was punked. I was Charlie Murphy. But then, I eventually wore the blouse. There’s a point when playing a sports game that we get so good that we’re unstoppable. In basketball it involves learning the ropes of whatever the game’s main hooks are, whether it’s learning to pass efficiently or managing our plays and player positioning. On the flip side, arcade basketball games mainly focus on slams or playing aggressive defense in hopes of hitting as many points as possible. It’s not about the skill there, but the speed. Saber Interactive’s NBA Playgrounds is somewhere in between these two ends of the spectrum. It revels in nostalgia; the NBA Jam and NBA Street comparisons are in its DNA, with 2-on-2 court battles of off-proportion players filled with wild dunks and exploding baskets. It also has a level of serious basketball built into it, as it relies on accuracy of shots and expert ball management. In order to get really good at the game we need to understand how to balance the play styles. Failure to do both well results in lopsided losses against AI opponents, just like Charlie Murphy against Prince. Getting good at Playgrounds means putting the time in to learn its machinations. Timing is everything, from scoring to rebounding to the occasional but usually impossible alley-oop. Shooting is initially difficult; I think I only scored somewhere around 6 points in each of my first few games, whereas the computer team would drop 30-35. Every player has a different sweet spot for shooting, regardless of their actually stat rating. For two different players who are rated 8, we need to either let go of the ball on the way up into a shot, exactly at the peak of it, or just over. It take a little bit of practice to time our shots correctly (the game tells us if we’re too late or too early) and is a bit of a turn off to do it for every character, but thankfully there’s a crutch. A “lottery meter” gains momentum as we steal the ball, block, or pull off any other number of plays. Once that meter fills up we’re rewarded a timed on-court bonus, such as doubling points if we can score from specific areas on the court or a guaranteed score from our next attempt. This isn’t the streetball that Charlie Murphy was prepared for, or the arcade game I anticipated. With so many specificities to manage, the casual player may struggle to find their place. The advantage that Playgrounds does have over its arcade predecessors is that it includes a light RPG meta game. The more we play (win or lose), the more experience points we earn. Leveling up our profiles gives us the opportunity to open card packs, which grant us new players. Leveling up our players unlocks more of their moves, which is important when we’re stuck with a bad combination early on. The roster is good but not great, and mixes historical athletes with modern ones at around 5 players per team. There are a few big stars, like LeBron James and Shaq, but they’re also joined by lesser known guys like Steven Adams and Billy Cunningham.As a lifelong Pistons fan I unlocked Bill Laimbeer right away. I soon realized that using him meant that I was at an immediate disadvantage since he’s really not all that good. With balance being key to team selection, having someone who can grab the ball more than makes up for a poor shooting teammate. Laimbeer wasn’t so bad by the end of a few games. The play modes aren’t necessarily bursting with content, and playing against a friend online is near impossible. The game doesn’t include the option to square off against friends online, and the Switch version doesn’t even have online play yet (it’s supposedly coming ‘soon”), so it ultimately feels a little lonely. The Switch version is Joy-Con friendly, so that even with one console we can have in-room multiplayer gaming, even on the go. The visuals are big and bold and clear enough that they function well when the device is undocked and we’re playing on the smaller screen. The tournaments are interesting enough, giving us challenges (get a certain number of steals, score a set amount of three-pointers, etc) to coincide with our necessity to win four matches. 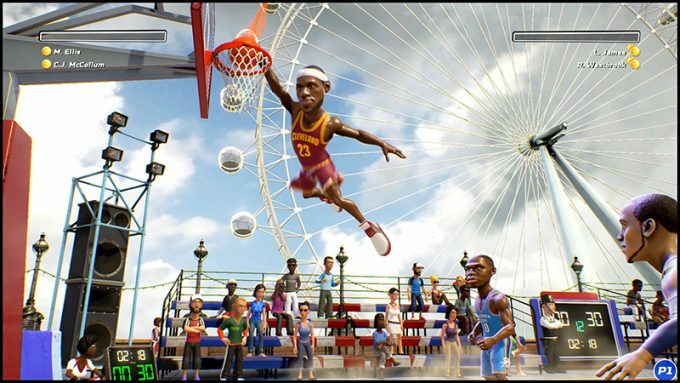 They take place around the world on themed basketball courts. Shanghai is especially pretty. Apart from that, though, there isn’t a ton of substance. The player collection aspect is fun, but it may not be enough to pull us in every day. Saber Interactive have promised more content is on the way, including players and online modes, so that could extend the play time. 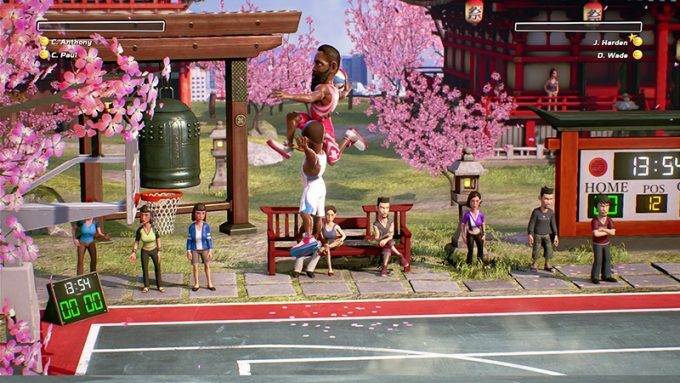 NBA Playgrounds scratches an itch that’s been getting more noticeable as licensed sports games become simulation heavy. In a sort of sporting game lull, it’s arriving at a good time and gives those that do get into it a hook to keep going. It’s not the game I was expecting it to be, and my lack of preparedness was exposed on the virtual court dozens of times, but by the time I got going I was settling into a rhythm that was almost musical in approach. Perhaps that’s what made Prince’s embarrassment of Charlie Murphy so complete: Charlie was expecting pop music, but Prince delivered more of a symphonic suite. Rest in Peace, Charlie Murphy and Prince. This review is based on a retail Nintendo Switch eShop code provided by Saber Interactive to SideQuesting. About the Author: Dali grew up with NBA Jam and the arcade genre as his preferred style of sports gaming, and at one point had lodged more than 200 combined hours of NBA Jam and NHL 2 on 2 Open Ice Challenge.